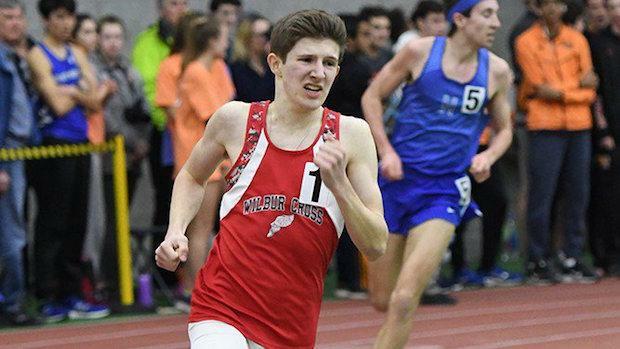 Top 10 Races To Watch From CIAC Class Championship Week! Bloomfield's Terry Miller is US #2 in the 55m and she left everyone way behind in that race, but in the 300m in the final section 5 she was pitted against her teammate Jillian Mars who had won the 600m. Miller 39.91, Mars 39.93. Darien over Notre Dame 3:34.79 to 3:34.97. Great end of the night battle. Darien over East Lyme 4:12.22 to 4:12.85. Great end of the night battle. Wilbur Cross's Travis Martin runs a CT #1 4:19.79 while doubling with a 5th in competitive 3200 and running a relay all out. Danbury's Jacob Hefele wins in strong 3200 field with a CT #1 9:21.83. Glastonbury also won the 4x200, and they ended off a great night with a dominating win in the final event. Ridgefield also won SMR, but they had a also had a big win in the 4x8. Sacred Heart's Edward Williams was a little off his time at Yale, but he flew here. Old Saybrook's Grace Hanratty did a CT best 2:58.03. Deshaune Poole of Hillhouse also won the 55H, and he had a strong follow up run to win the 300m.